built by many hands or feet. from pasts that are long lost. the sum of much, so little left. Hi Ian. Please accept my humble award nomination – `The should be famous five’ award; the fabulously named Epically Awesome Award of Epic Awesomeness. What a nice surprise Dale! I do appreciate these peer group nominations. They mean quite a lot in my book. & I also look forward to seeing previously unknown blogs (unknown to me anyway). Very kind of you indeed. Note- have taken the liberty of editing your link Dale, to include in a dedicated future post. Ian, that is a powerful poem that pulls in the long lost pasts to meet the residue of the present. The opening tercet invokes the scene, the next its past, and the last the ‘longing and regret’ of an irreversible decay. And each strikes with a force harder than the previous one. Ian, such a beautiful and poignant poem. I especially love the second verse and can relate to dreaming of “a vibration, scent or residue, from pasts that are long lost.” I am always interested in the history and stories of the land and the people from times gone by. 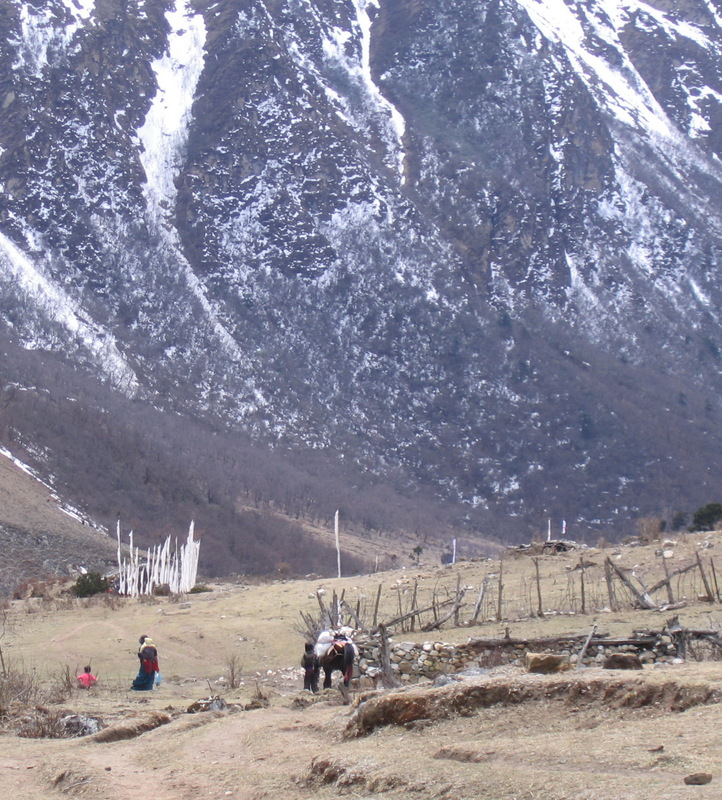 Your photo of Western Bhutan perfectly complements your poem. The people with the funeral flags appear as transient players against the larger backdrop of the land, so ancient and ever changing. Is that the Himalayas in the background? Spectacular. So glad you liked it JL. A nice little thumbnail in words – if that makes sense. What a beautiful post, and your brilliant writing took me there. Architecture is fascinating and takes one’s thoughts to what it must have been like. architecture is one of my loves also. Places remain, we come and go. But still we leave some trace behind which reminds those who follow us of their own coming and going. A poignant and bittersweet reflection, Ian, like your lovely poem. Although we probably do have an inflated opinion of ourselves, I believe there is sometimes a `feeling’ left behind. I do have a strong recollection of those particular places. Lovely, Ian. I have those same thoughts when I see old places, especially abandoned country houses, wondering about who built or inhabited them and what life was like back then. I suspect it’s a big driver for travellers like you & I.